November 26, 2008 — Restructure! Without the second line, it was even more incomprehensible to me, and I was trying to figure out what it was supposed to mean. Is the white lady a Canadian of White South African descent, who, when encountering injustice, cries, “You’re discriminating against me because I’m African Canadian!”? The second line disambiguates the meaning of “I am African Canadian when I’m encountering injustice,” but the statement still does not make that much sense. Ethnicity is not something that can be turned on and off when convenient. If this poster is supposed to be about race, race cannot be turned on and off, either. It is not the case that ethnic or racial minorities can bypass discrimination if they only identified as “White Canadian” when encountering injustice. At the Canadian Centre for Diversity, we have a vision: A Canadian society without prejudice and discrimination. A society that celebrates diversity, difference, and inclusion. 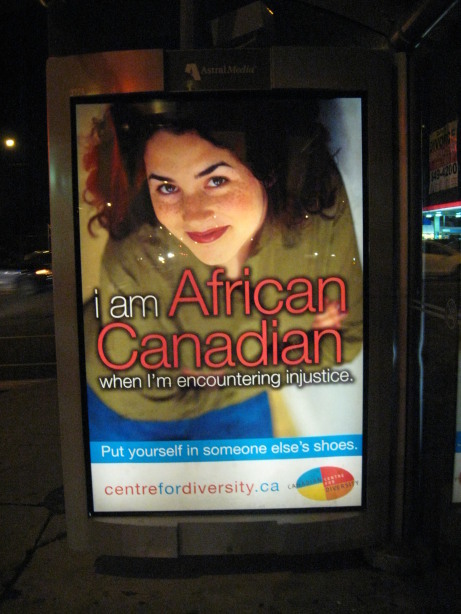 It seems quite odd to me that a centre that celebrates diversity has created an advertisement that appeals to White Canadians specifically. As a Canadian of colour, I find something offensive about ethnic appropriation to prove a point. I do not think that White Canadians can understand what it is like to be a Canadian of colour by simply trying to imagine it. Temporarily identifying as an ethnicity that is not yours does not make you understand better.